If you receive an SMTP Discovery Warning Report, you'll need to add and associate aliases with the appropriate end user addresses. You have 4 weeks after receiving the report to address these accounts. If you fail to do so, it could impact mail flow for the affected addresses, and it could result in getting billed for aliases/functional accounts. Log in to your Proofpoint account. 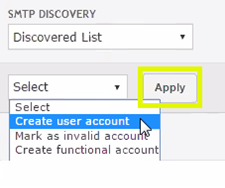 Click the Users and Groups tab, and then the SMTP Discovery tab. Note: If you did not receive an email with the "SMTP Discovery Warning Report," the email or alias you want to edit may not display. 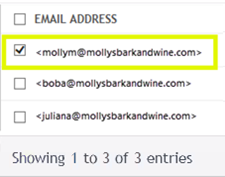 Check the box next to the alias that you want to associate with an email address. Under OR ADD AS ALIAS, enter the email address of the end user that you want to associate with the alias. Note: You can, optionally, enter the FIRSTNAME and SURNAME. If the account is valid, click Create user account, and then click Apply. If the account is invalid, click Mark as invalid account, and then click Apply. Email ending up in reciever's Junk Mail folder?